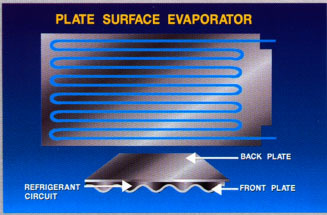 Plate surfaces of evaporators are of several kinds. As a bare-tube evaporators, they are also called Prime surface coil. One popular version, as shown below, consists of two flat sheets of metal. One in the form of a coil pipe pressed into it, while other apartments. Two welded together, forming a circuit through which the refrigerant travel. Plate adds heat transfer surface area of the coil, but not to such an extent that the fins to do. 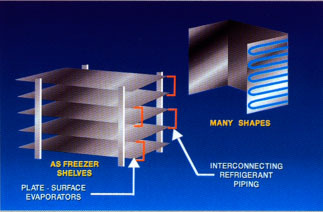 This type of evaporator popular refrigerators and freezers.